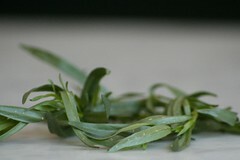 Tarragon tastes sort of like anise and pairs well with chocolate. I was eager to try the two together in a cupcake. I decided to use a basic chocolate cupcake base (I used the Magnolia devil’s food recipe because I wanted to try it) and added fresh tarragon to that. I guessed at a tablespoon of the chopped herb, but the taste was very subtle. Hence I decided to get tarragon in the frosting as well. All-in-all, I still couldn’t taste enough of the tarragon for my liking. I would have topped each with a fresh tarragon leaf if I had any handy. A side note: The frosting calls for a tarragon infused simple syrup; this is the first time I have made some. I must say that it is extremely tasty and I could see it being a great addition to herbal ice teas, vodka based drinks, and homemade ice cream… same as the lavender simple syrup. Yum. Lastly, the devil’s food recipe was fine, but a little drier than I expected. Baking is temperamental though, so it might work out better for others (or next time, in my case). These sound interesting. Thanks for the recipe! Never tried to a cupcake with herbs. What a lucky hubby u have ! 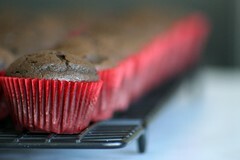 Mm..all your cupcakes sound (and look) so delicious…will have to try a recipe soon. 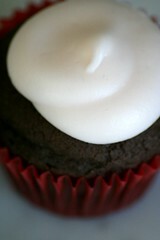 I was wondering where you got the red cupcake liners, and if you know where one can find dark brown ones? Thanks! yumyumyumyumyum. your cupcakes are beautiful. Waiting with baited breath for the next recipe!! Hopefully you are inspired soon! Oh, I am inspired! Just so busy with a new job and a big party I am throwing this weekend :( I am planning my next cupcake, though, that’s for sure. Do you know where I can get a good cupcake wrapper? All the ones in the grocery store are really tiny. I mostly use the regular size papers that you get at the grocery store. I don’t use jumbo size papers, but I think that I saw them at Bed, Bath, & Beyond. I googled jumbo cupcake papers and found these. 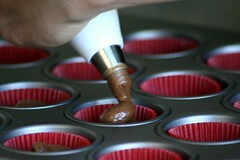 I am a huge fan of the chockylit cupcake site, I check in regularly to browse through the recipes. My boyfriend loves it too because he gets to taste all of my experimental cupcakes. I was wondering if someone knows where I could buy those sweet white cups in which you bake the cakes. I have searched all shops in The Netherlands (that’s where I ‘m from) but I don’t think they sell them here. I have made it my personal mission to search the world to find them so I can impress my dutch friends with my cool cups. I really hope someone can help me!!! These look really good. Where did you find the awesome red liners? I have been looking all over for them. hello, i need some advise. all my cupcakes bake fine in the oven, but as soon as i take them out they collapse in the middle. what am i doing wrong? ive tried different recipes, but no success. I got the little red cups – which are actually candy cups and not cupcake cups – at a cake supply store in Daly City, CA called Sugar N Spice. But I know Sugarcraft has them and probably other online stores, too. i order chockylit’s cupcakes for ALL my social events. they are a dream come true! Hello. I really love your blog, your cupcakes really look delicious. By the way, I need some advice. I’ll make some apple cupcake with cream cheese frosting for charity. I’m just afraid that the cream cheese frosting melt. Do you have any idea to prevent this? Can I use whipped heavy cream on my cream cheese frosting instead of using a half stick of butter?